News from the Tristan da Cunha Government for 2006 to 2008, including the Governor, the Resident Administrator, Chief Islander and Tristan-related official events in the UK and abroad. Tasha Reilly arrived aboard MV Edinburgh on Saturday 1st November 2008 to take up the new temporary post of Deputy to Tristan Administrator David Morley. For a picture and details of Tasha's 5 month posting see Station News Page. Tristan da Cunha's Chief Islander Conrad Glass attended the latest Overseas Territories Consultative Council (OTCC) meeting in London on 28th - 29th October 2008. The St Helena Governor Andrew Gurr is planning to visit Tristan da Cunha for the first time in March 2009, possibly aboard HMS Endurance. The last visit by a Governor of St Helena (Tristan da Cunha and Ascension) was by Mike Clancy who helped mark the 500th Anniversary of the discovery of the island when he visited on the Tristan Association RMS St Helena Cruise in February 2006. Attorney General to make first Tristan visit. The Attorney General, Ken Baddon, will visit Tristan da Cunha early in 2009. The visit will be funded by the Foreign & Commonwealth Office (FCO) under the Overseas Territories Project Fund, and its main purpose is to ensure proper consultation with the people of Tristan da Cunha on the question of possible constitutional reform. However, the shipping schedules mean that he will be on the Island for about 23 days and will therefore have time to deal also with some additional local legal issues. Although an Ordinance has provided, since 1997, that the Attorney General in St. Helena shall be the Attorney General of Tristan da Cunha, it is thought that this will be the first visit to the Islands by a serving Attorney General. See also our St Helena Governor Page. David Morley and his wife Jacki returned to Tristan aboard the MV Kelso on Saturday 21st September and took over again as resident Administrator from Chief Islander Conrad Glass who was acting Administrator since David's departure on 2nd July. David carried out considerable business during his time in Cape Town, and we will be reporting on important news on the arrival of a new crane, further harbour refurbishment and progress towards re-building the fish factory shortly. 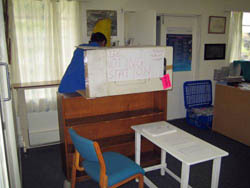 Cynthia Green reports that Charmaine Swain concluded her time as Tristan House Manager on 31st July 2008, and with effect from 1st August the House will be managed by Eugene and Joy Stoffberg. We hope to publish a separate page giving details and photographs of Tristan House before long. Tristan House will be managed by Charmain Swain from 1st June 2008 and the new driver is Eugene Stoffberg. Eugene is married to Islander Joy (see Repetto) and is well known to Islanders as former skipper of the fishing vessel MV Hilary and later fishing manager aboard MV Hekla. The Tristan Government thanks Charmain's husband Julian Swain for all his hard work in establishing Tristan House and running it so successfully over the years. Julian is now moving on to different work. Islanders will also be relieved that Tristan House remains open in the current economic climate. Revised fees are being charged and can be checked on the Visits : Accommodation Page where we also hope to publish further details and images of Tristan House in due course. A paper has been published by Governor Andrew Gurr on 28th April 2008 to inform a consultation on a revised constitution. We publish the paper in full on a new Constitution Reform Page to which further news of the development of this important issue will be added in due course. Chris Bates has been appointed Tristan da Cunha Government Representative in the UK . Chris is 59 and lives in Birmingham . Before retirement in 2004 Chris had a wealth of employment experience, including: as a newspaper reporter; work for the BBC as a producer, broadcaster and press officer; and for the London Norwegian Embassy as a manager of their public relations programme. During self-employment from 1996 he did a variety work including television, publishing, and for companies in Belgium and Estonia. Chris first became involved with Tristan da Cunha when he edited Conrad Glass’ book Rockhopper Copper in 2005 and he visited the island with his wife Julie on the 2006 Agulhas trip. 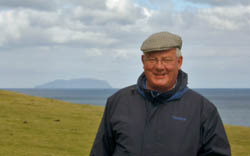 Chris is a member of the Tristan da Cunha Association, contributing a first article on ‘Fergie’ Tractors to the February 2008 Newsletter and we look forward to hearing of his work to support the Tristan Government in the future. This post was the first Tristan da Cunha appointment to be advertised on www.tristandc.com, and we await the appointment of a new manager for Tristan House in Cape Town which was also advertised on our South Atlantic Jobs page. The photograph above shows Chris on Tristan in 2006 with Inaccessible Island behind. Administrator David Morley made an important Atlantic FM radio broadcast to the Tristan da Cunha community on Sunday 9th March. Effectively it was a budget speech, and sounded a warning that the Tristan Island Council needed to make some difficult decisions to limit spending and emphasised the importance of maximising income as for many years expenditure had exceeded income and reserves were at a dangerously low level. Read the whole broadcast word for word on the separate Budget Broadcast 2008 page. On behalf of the people of Tristan I thank you for your message and welcome you to St Helena. We all hope that you and Mrs Gurr will settle in well and enjoy your stay at Jamestown . And we look forward to extending a warm Tristan welcome to you both as soon as the opportunity for a visit here presents itself. Your advice about financial matters comes at an opportune moment. It is clear that we face some difficult decisions during the next few months and I shall ensure that I and my fellow Councillors provide strong and sensible leadership during the stormy waters which lie ahead. I know we can count on your support and advice, and that of your Administrator, to see us through. As I said in my Inaugural address, I’m absolutely delighted to be here. But as I spoke mostly about St Helena I wanted to send you all a more personal message of greetings and good wishes, and let you know some of my thinking on matters that relate specifically to Tristan. I’m aware that you face some tough challenges in the next two or three years. In the short term, to get the harbour repaired, so that it’s still there when the refurbishment project begins. I’m pleased to hear that there now seems a very real likelihood that something, at last, is going to be done. And the future of the lobster concession – I applaud Councillors for deciding to try and secure a better deal from Ovenstone and I had a very useful meeting with Andrew James in London as well as having time, during my journey, to read the documentation surrounding their proposal. I shall be following developments closely. But, as you all know, the underlying challenge on Tristan is a financial one. So long as you continue to spend more than you earn, and your Reserves accordingly dwindle, your future remains uncertain. This puts at risk the independence that you enjoy, and of which you are all rightly so proud. A great deal of what I said in my Address applies here – I hope the island Councillors will take a strong lead in helping my Administrator to submit to me a sensible budget following the current Estimates round. I also meant what I said when I referred to my visiting Tristan. I want to come as soon as possible and David Morley and I will be working on plans for a visit at an appropriate time. 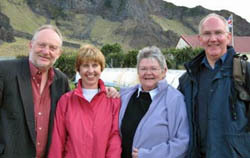 Incoming Administrator David Morley and his wife Jacki, left, were only able to briefly meet outgoing Administrator Mike Hentley and his wife Janice on Wednesday 12th September as the Hentley's were hailed to join the last evening helicopter flight to make sure they were aboard SA Agulhas as deteriorating weather brought forward the onward journey to Gough Island. - see below and on the Administrator's Page for more details of David and his arrival. The Foreign and Commonwealth Office have announced the appointment of the new Governor for St Helena its Dependencies of Tristan da Cunha and Ascension on 18th September 2007. Mr Andrew Gurr has been appointed Governor of St Helena in succession to Mr Michael Clancy. Mr Gurr is married with two children, and he will take up his new appointment in November 2007.
tristandc.com's manager looks forward to news of the Governor's first visit to Tristan da Cunha and hopes this may be aboard the RMS St Helena which has unfortunately abandoned regular trips to St Helena's southern outpost. David Morley became Tristan da Cunha's 20th resident Administrator on Wednesday 12th September when he was formally sworn in at a ceremony in the Council Chamber. David is pictured left with his wife Jacki, who is accompanying him during his Tristan sojourn. David was welcomed ashore during a Reception on Wednesday evening at the Prince Philip Hall hosted by Chief Islander Conrad Glass. Outgoing Administrator Mike Hentley and his wife Janice joined SA Agulhas as the ship continued to Gough Island on the first leg of their return to England. See also Administrator's page for more details of Tristan's new h'Admin., and Shipping News page for details of SA Agulhas' voyage. Mike Hentley returned from Cape Town for his final few months as Administrator and takes the reins from Acting Administrator and Chief Islander Conrad Glass. 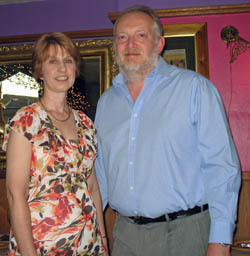 Mike and Janice Hentley will depart on the October Agulhas voyage as David Morley takes over as the new Administrator. David will be accompanied by his wife Jacki. 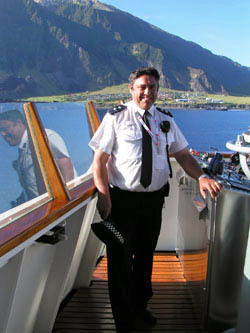 Pictured left is Tristan da Cunha's Police Inspector Conrad Glass who becomes the 6th islander to be elected Chief. Conrad is the great-great-great grandson of Corporal William Glass who founded the Tristan community. Conrad is the son of Edwin (Spike) and Monica Glass and lives with his wife Sharon and son Leon. Turnout was slightly down from the usual 60-70% at the elections held on Monday 19th March 2007 for Chief Islander and for eight elected Island Councillors. Bad weather had delayed until that morning the visit of the first cruise ship of the season, the 'National Geographic Endeavour' - originally due over the weekend. Although the polling station opened early to enable those involved with the visit to vote before going to work, it may be that some community members were either too busy to vote or simply forgot to do so in all the excitement. In the event, of the 226 registered voters 127 completed ballot papers were handed in: a turnout of 56.2%. These included 10 postal votes introduced for the first time for Tristanians currently visiting St Helena or Cape Town. The polling station at Camogli hospital, opened from 0630 to 0700 for the early birds, and then again from 0800 - 1800. . When the polls closed, Medical Officer Carel Van de Merwe acting as Presiding Officer counted the votes with help from his wife Ingrid and from Administrator Mike Hentley. Islander casting his vote in the Tristan da Cunha Island Council Election Polling Booth inside the Camogli Hospital Polling Station presided over by Medical Officer Dr Carel Van de Merwe. The new Chief Islander is Conrad Glass (Head of Police Department), who had a narrow 9 vote victory over a former Chief Islander, James Glass (Head of Agriculture & Natural Resources). For the Island Council, it seems that voters were looking for some new faces as none of the five candidates standing for re-election were successful this time round. The new team include both Connie and James Glass, Lorraine Repetto and Iris Green of Finance Department, Postmaster Ian Lavarello and Lillie Swain from the Post Office, Dereck Rogers the Agricultural & Veterinary Officer, and Robin Repetto, an electrician working for PWD. In addition to the elected Island Council, three former Chief Islanders - Lewis Glass, Anne Green and Harold Green have been appointed by Administrator Mike Hentley. 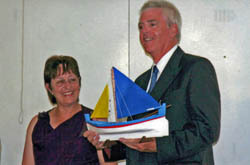 Chief Islander Anne Green presents a model longboat to The Governor of St Helena (Tristan da Cunha and Ascension) Mike Clancy at a Commemorative Ceremony to mark the 500th Anniversary of the discovery of the island in February 2006.